I have a confession. Every now and again I will sneak off to the shops to buy a tub of chocolate mousse and vanilla yoghurt. This treat is SO decadent – the chocolate mousse rich, velvety and chocolate while the vanilla yoghurt is sweet and smooth and goes so nicely with the mousse. The tubs are only little so I use the smallest of my tea spoons and slowly savour each mouthful. If the kids are around I’ll get them one each also and we all sit there quietly taking in the flavours and textures. I love that they can be still at times and really be present with what they are eating. Even though this product is good quality there are still some ingredients that I am not happy with. Well today I created something that rivals this dish and for me there are no nasties, no diary, no gluten and I always have the ingredients on hand so can make it whenever I wish. Hmmm maybe that part isn’t good! I’m looking forward to when the kids come home so they can give me their opinion. Place all chocolate mousse ingredients into a high speed blender and blend until smooth. Use the tamper to push the ingredients down so they blend together or turn the blender off and scrap the sides down and few times. Place all vanilla cashew cream ingredients into a high speed blender and blend until smooth. Again use the tamper or scrap the sides down until all ingredients are blended together and the consistency is smooth. Place vanilla cashew cream int he fridge to chill for 1 hour. 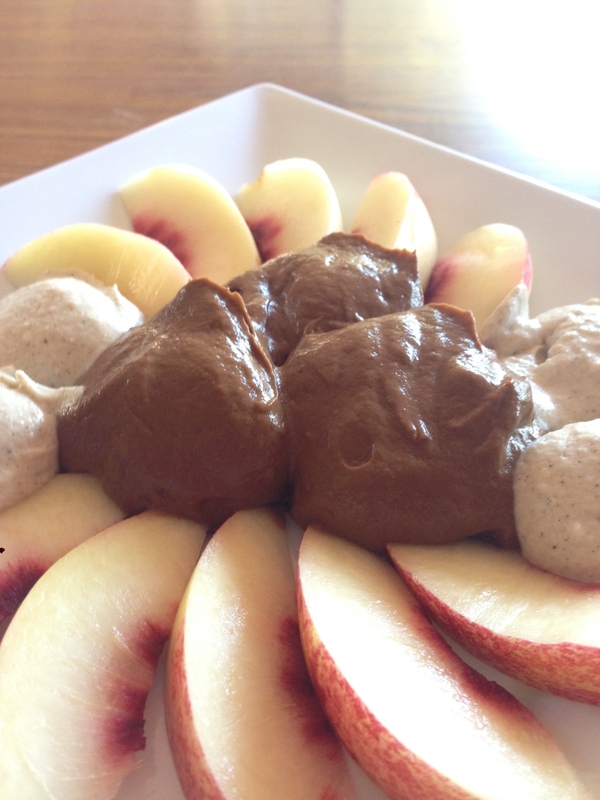 To serve, place a few spoonfuls of mousse into and bowl along with a few spoonfuls of the vanilla cashew cream. I also added slices of a nectarine. I hope you enjoy this recipe. It is very decadent and was a great way to celebrate some fantastic news I received. OMG – my mouth is watering. Can’t wait to try this divine recipe. Thanks for sharing your gifts so generously with us Vicki!